~ The Visual Adventure ~: First birding adventure of the year! First birding adventure of the year! Today was a fantastic start to this year's outdoor activities, and also a confirmation that Tony Beck's company logo "Always an Adventure", is totally correct! 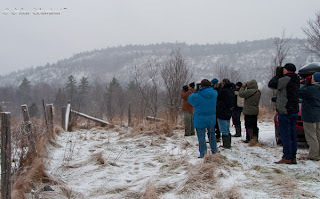 The first birding excursion this year was carried out in Gatineau Park, Quebec, Canada. 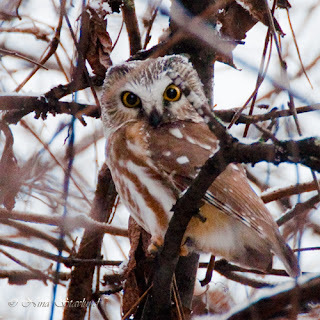 Our first bird of the morning was a Northern Saw-whet Owl. 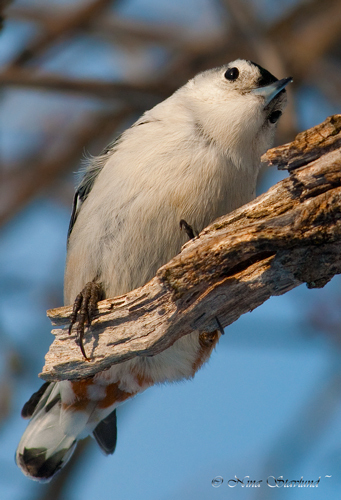 A lifer for me and a most beautiful bird! We were walking along a trail and suddenly a bunch of angry chickadees caught our attention. Tony knew exactly where to go and what to look for. From the trail we moved on, driving along the Gatineau Escarpment , stopping, walking, looking and listening. The weather was working against us as heavy snowfall increased during the late morning. But, we were so pumped-up after the awesome Saw-whet owl that nothing could stop us. We spotted a beautiful adult Bald Eagle and jumped out of our cars to put the scope on it. We also noticed an adult Red-Tailed Hawk and 2 coyotes nearby. One coyote disappeared from sight, but the second one was still visible. The scene that followed was like something out of a National Geographic Special. The Bald Eagle took off from its branch and started to mob the poor coyote. It was unclear as to the purpose of the Eagle's aggression. Perhaps it was hungry or just territorial. But, the Eagle's last dive, resulted in the coyote's leap high into the air towards the Eagle. For just a fraction of a second, they were both dancing above the ground, one hunting the other, the other protecting itself with this powerful move. We were all in awe! What a fantastic and most amazing thing to witness. The poor coyote looked quite scared when leaving the area. The Eagle was still chasing it a bit until it gave up and returned to its perch. We were all standing there with jaw-drops, and an extremely hard grip on our binoculars. Later on along with 3 more Bald Eagles, we had an adult Golden Eagle that flew off almost as quickly as we spotted it. 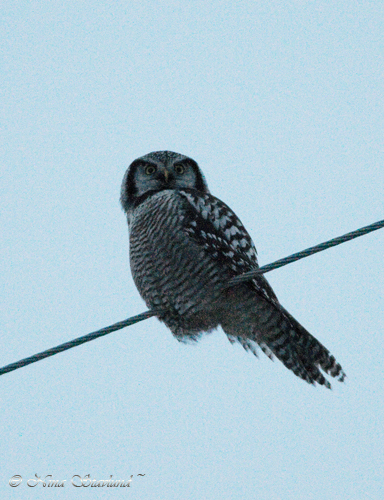 And, just to make a perfect day complete, we ended the whole excursion with a Northern Hawk Owl! A birding day with 4 highlights. Could the year start any better...? Gray Squirrel - A lot! Sounds like a wonderful day!! I wonder what we'll see tomorrow? Am not a bird watcher but from a photography point of view, the trip looks like a perfect start to the year Nina. It was indeed a super day! Mayank, One of the best times to take pictures is on an excursion like that. You are bound to get a picture of something. And if not, at least you've been outside in the nature exploring. This particular day was not good for photography tho, because of all the snow.